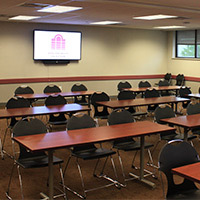 The Hadley Union Building has seven rooms which can be reserved by college departments and recognized groups and organizations. 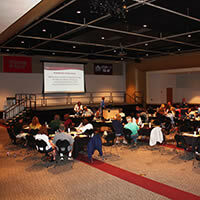 ~Our largest room, the Ohio Room, has a permanent 32’ x 16’ stage which can be altered with a runway or thrust. 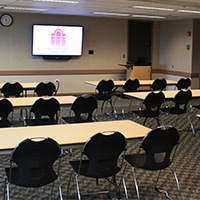 The Ohio Room is equipped with HD projection and a sound system accompanied by hand held or lavalier microphones. ~All rooms can be reserved through our online reservation page. We also offer tabling space to any recognized groups or organizations on campus that would like to fundraise or hold promotions. Tables are located in the atrium of the fitness center and outside of the HUB, depending on weather. Tables are 8’ feet wide and locations will be based on availability. Additionally, the Student Co-op rents the College Lodge and Ski Hut, located just a few miles from campus. 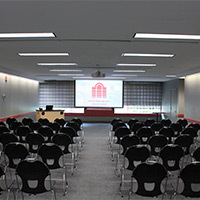 The Ohio Room is a multipurpose room which hosts large events from concerts to conferences. 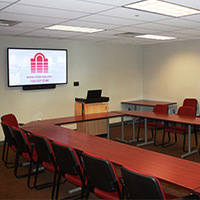 The Susquehanna room is our largest conference room and is conveniently located off our atrium. The Monongahela Room can be divided into two rooms with an air wall and can hold up to 84 patrons. The Allegheny Room is our most versatile room with various room configurations. 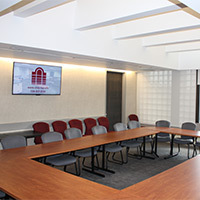 The Conemaugh Room is a boardroom style set up that can hold up to 39 patrons. The Knowlton Room is a boardroom style set up that can seat up to 35 patrons. 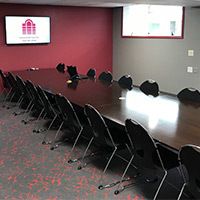 The Schuylkill Room is a boardroom style set up that can seat up to 18 patrons. 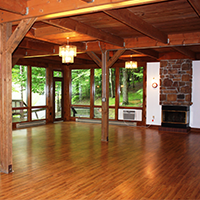 Located a few miles off campus, host your meetings and social functions in a beautiful setting.